We print your tent card in A5 size on 300 gsm art paper. You can either select no lamination, matt lamination or gloss lamination. 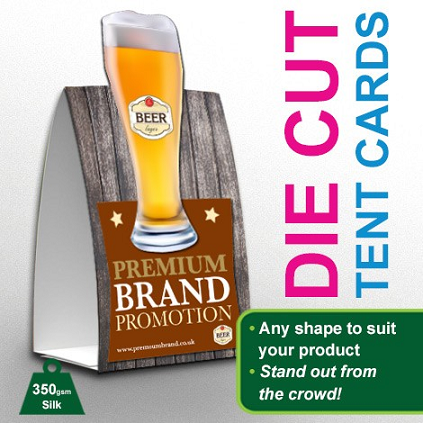 Tent cards are classy eye catching marketing tool. All businesses big and small can use them for marketing their products. Special offers, discount, freebies, new launches can be shared via tent cards. They don't require hell lot of fabrication work, only creasing and pasting at the bottom. We print them in thicker stock of paper mainly card stock 300/350 gsm thick paper as used in the business card. Thick ivory card will thickness in excess of 330 gsm can also be used as it is more crisp than art card. Ideally one should go with both sides printing of tent cards if both sides are visible. We recently printed bulk tent cards for Johnson & Johnson a major pharma unit, for their Mumbai branch. It was part of a yearly seminar for sessions in 2016-2017, their creative team came with an innovative medicine shape tent cards. They had different creatives for both front and back & it was visually appealing. Standard size of tent card normally is A5 size. Other common sizes are 4x6 inches, 6x9 inches etc. We also prepare tent cards as per your custom size for minimum order of 100 piece. Custom shapes are also available which are laser die cut. You can laminate your cards with gloss or matt lamination to make it scratchless. Gloss lamination is shiny lamination where as matt lamination is anti glare lamination which is not that visible. Lamination increases the life and protect the surface from regular wear & tear. It also make the surface smooth to touch. If you intent to use your cards for more than 2 weeks we recommend to go with lamination. Dust particles will also not settle on the print. At Whizz Prints, we also offer spot uv lamination on selected portion of your creative at an additional cost. You can highlight company logo, discount percentage, important message. With spot uv effect that portion will highlight more in comparison to the rest of the card. Spot uv is always applied after matt lamination on the card. 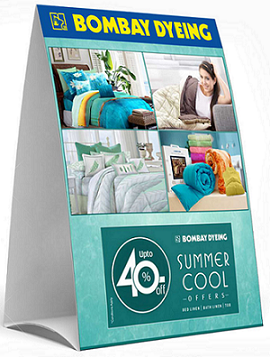 Tent card calendars are also known as table top calendars. We offer premium pre printed calendar designs to choose from. You can also offer your own personalize design for printing. Personalization with name and message is also available. You can ask your designer or hire one of our designer to design it for you. Design file should be at least in 300 DPI. You can upload your design file in any file format like adobe illustrator, corel draw, adobe photoshop, or adobe pdf. Do you print tent card in any other paper apart from 300 gsm? We are printing art card on 300 gsm. 300 gsm or above thickness paper is recommended for tent card else it may not stand. If you are looking for any other stock of paper kindly contact us. Can we print tent card in custom size as well? We also print tent card in custom sizes as per your requirement for MOQ of 100 pcs. If I place order for two designs 50 each then will I have to pay rates for 100 tent cards? If your both companies designs are different then you have to pay for 50 x 2 nos. Tent card are printed in A5 size on 300 gsm art paper without lamination. Tent card are printed in A5 size on 300 gsm art paper with gloss lamination. Gloss lamination is a shiny lamination. Tent card are printed in A5 size on 300 gsm art paper with matt lamination. Matt lamination is more subtle with corporate look.